Sometimes I eat clean. Which usually means from 6:45 a.m. to 4 p.m., I eat clean and then I have a glass of wine, and then another and then a Girl Scout cookie. I'm a work in progress. One thing I've found that makes clean eating easy is a quick, but huge prep session. 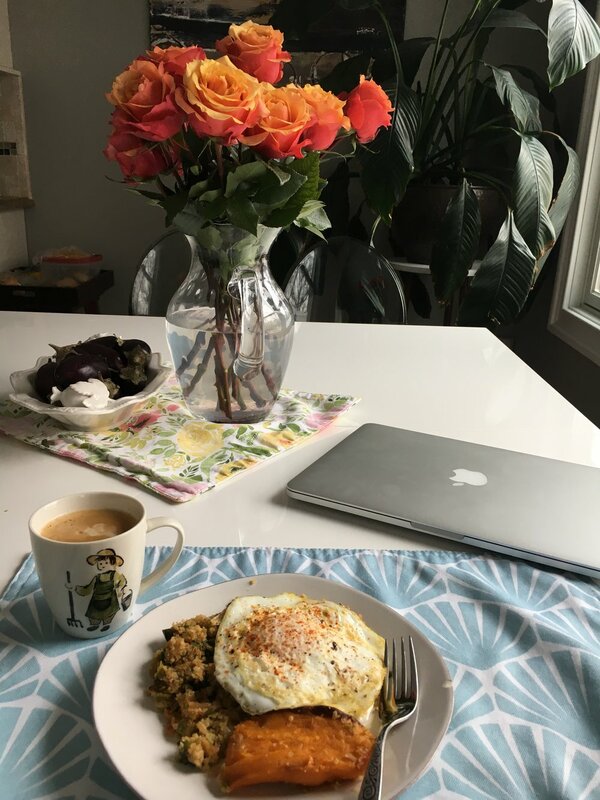 I accomplish this in two hours and focus on making the components for breakfasts and lunches I can make in 5 or 10 minutes during the week. My last prep included roasted spaghetti squash and sweet potatoes, cauliflower fried rice, veggie stir fry, and marinated chicken thighs. First I microwaved the squash for 5 minutes to make it easy to cut. While that was happening I washed and halved sweet potatoes. Then I halved and scooped the squash, drizzled everything with salt and pepper and roasted for 45 minutes on 400. I use parchment for roasting to make clean-up easy. I love roasted sweet potatoes with a smear of miso and butter, topped with a fried egg. Clean eating and so satisfying. While those veggies roast, I chop. Broccoli, reserving the stems for the cauliflower rice, cabbage (peeling the outer leaves off to save for steamed dumplings), red pepper, snow peas, garlic and onion, all for the stir fry. 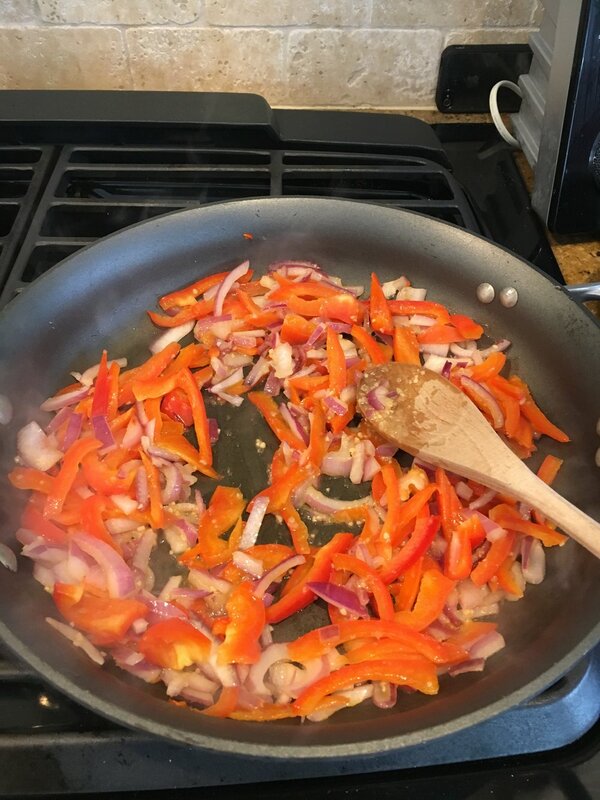 Saute the onion, peppers and garlic first for about 5 min in 2 T. oil (I used grapeseed). Then add the cabbage, broccoli and peas, cover with a lid and steam for about 5 min. Take the lid off, stir and cover again for 2 min. Then take the lid off and keep stirring until they are cooked through but still have good color. These ingredients promote gut-healing, include probiotics and pre-biotics to support a healthy micro-biome and make everything taste AMAZING. If you are interested in a healthy gut, read this book. I combined these into a sauce (recipe below) and poured it over the stir-fry and then cooked for a few more minutes, stirring once or twice. And voila. Stir-fry (which my kids loved), often served with brown rice or chicken thighs or both. Chicken thighs. They get the magic ingredient treatment, a 30 min. marinade, and then browned on each side for 5 minutes and finished in that 400 oven for 15 min., after the squash and sweet potatoes come out. And finally cauliflower and kale fried rice. This recipe is from Gwyneth Paltrow's It's All Easy cookbook. The only change I make is to also pulse together the broccoli stalks with the cauliflower in the food processor, because no need to waste. I'll include the recipe below, as well. There is nothing bad about that, both for your belly and your mouth. And if you spend a couple of hours on Sunday or Monday cooking, you can eat like that all week. Whisk all the ingredients together and pour over stir-fry after the vegetables are tender. Cook for 2 more minutes. *You can use this to marinate meat, too. 1. 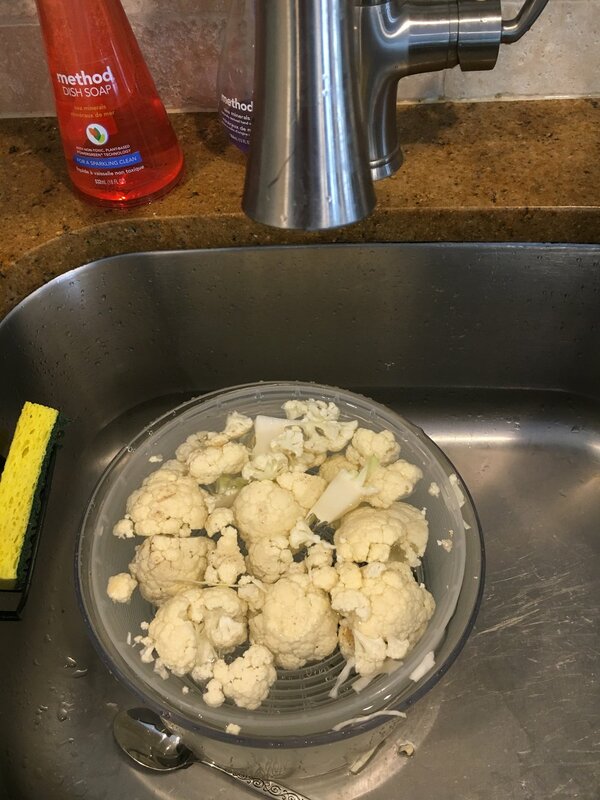 Cut the cauliflower and broccoli into small florets, then pulse in a food processor until the pieces are the size of couscous (you should have about 2 cups). 2. Heat the grapeseed and sesame oils in a large nonstick sauté pan over high heat. Add the kale and cauliflower mixture and sauté until the kale is wilted and the cauliflower is beginning to brown, 3 to 5 minutes. Mix in the scallions, kimchi, cilantro, and tamari.